* Repair fingers and toes. * Cure sleeping sickness, gut worms, and muscle parasites. * Cure malaria, plague, and flu. * Cure or inject sensory and fibrous mechanites. * Use glitterworld medicine to cure chronic diseases. * Sedate patient. Increase immunity gaining speed. lasts around 3 days. * All new surgeries require researched first and require skilled doctor. * Increased surgery success chance. * All tables merged into one. Unlocks new recipes via researches. Old tables can still be unlocked with research. * All workbenches can be moved. * Removed vancidium and advanced component. Uses gold and plasteel instead. * Medicine and glitter medicines can be crafted. * Choppable limbs hasn't removed. * All animal prosthetics and organs are craftable in animal prosthetics workbench. Unlocks new recipes via researches. * Animal bionic arm, leg, lung, heart and brain, everything is craftable. * Paws, jaws, tusks etc can be repaired using plasteel, without using replacement. * Inject medicine to put animal into sleep and increase immunity gaining speed. * This mod set doctoring as same priority as firefighting, as in emergency. Just draft-undraft them they will forgo every need and job and make sure everyone is tended. Recommended to set doctoring as priority 1. - Failures no longer automatically destroy prosthetics/bionics/implants being installed. The item that was being installed will be returned, but with less health. This means that if you are installing an item that is worn out or damaged, failing too many times will destroy it. - Failures no longer damage or remove random body parts, and will prioritize adding surgical cuts on body parts that are near the part being operated on. - Minor failures now have a small chance to cause an infection on the body part being operated on. Major failures have a higher chance. Enables the extraction of neutroglycering from Boomalopes and Boomrats that can be used to craft Neutroamine. Boomrats now drop two chemicals every two days. Adds various new drugs and medicine. Feedback on balance and such would be very appriciated! Every update requires you remake your drug policies for the new drugs to appear. I appologies for this inconvenience. * Chloroform : Puts consumer to sleep. ( I will try and make opperations so you can use these drugs on other people at some point). * Made custom assemblies for custom drugs and overdose effects. * Suripu-Block : Prevents the Plague and Sleeping Sickness. * Worm-Burn : Kills pesky Gut Worms. * Isotono : Helps treat Carcinoma. * Vitamin C : Boosts your immune system! * Pain Away : Reduces pain, two pills recommended maximum per day. * Sedate now require Chloroform(If you use Rim PhD. require Rim PhD to be loaded last.) I afraid this make sedate too hard to acuire. * Crafting Chloroform require 2 neutroamine instead of 10. Also price has been decreased. * Research cost for Simple Drug has been greatly decreased(2500 to 1000.). All scars including brain injury can be removed. All destroyed fingers, toes, noses, mandible and ears are now repairable. Surgeries for animals, everything should be repairable, from claws to paws, tail, beak, scars, and even brain injury. Muscle parasites and gut worms can be removed by skilled doctor. All chronic diseases such as bed back or Alzheimer's can be cured with glitterworld medicine and highly skilled doctor, with low chance to kill patient on failed surgery. New operation to put patient into anesthesia for three days; forcing patient into resting, remove pain and increase immunity gaining speed. Herbal medicine cannot be used on most new surgeries. New surgeries takes many medicines to perform. Every artificial body parts are now manufacturable, from rudimentary steel arms and peg legs to simple prostheses to exoskeleton suit and power arm. New operations that remove limbs. Finally prostheses for the animal, from simple prostheses to rampaging bionic beast, all craftable. Dreaded 6 tables be gone, it is now all merged into a single table, unlocks new recipes with researches. New breakthrough in neurotrainer technology allows neurotrainers to rewrites neural pathways and change personality traits. Build your all masochistic psychopath army. Remove depressive, or volatile, all unworthy. 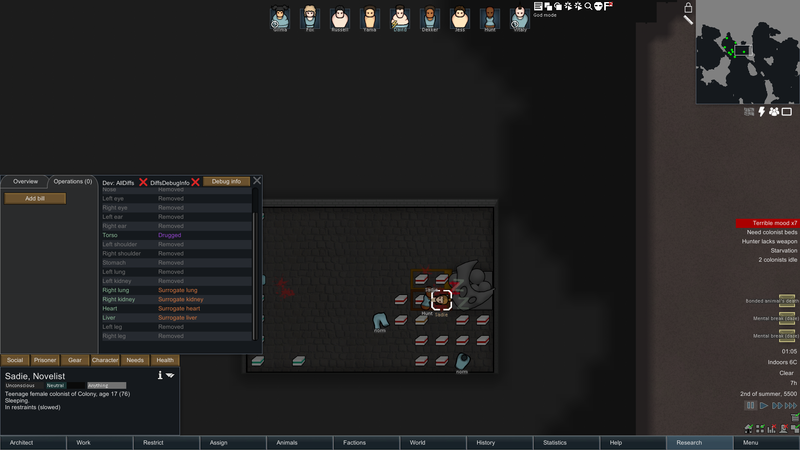 Rimworld is no place for the weak. Craft the neurotriners through new workbench, unlocked via research. Not updated. Many tweaks to each mods. NOTE : If you used EPOE, please remove all vancidium and advanced component before update. If that still break save try place items_Vancidium into ACM EPOE Thingdefs. NOTE : 0.4.2 will break your save if you have used 0.4.1 version. Please remove old mods before install new version. Probably will not break your save. Expanded Prosthetics and Organ Engineering by Ykara. A Dog Said by Latta. Chemecals Extraction and Neutroamine Crafting by ShadowTani. Realistic Medical System by Ykara. Renamed Folders & About by Adventurer. 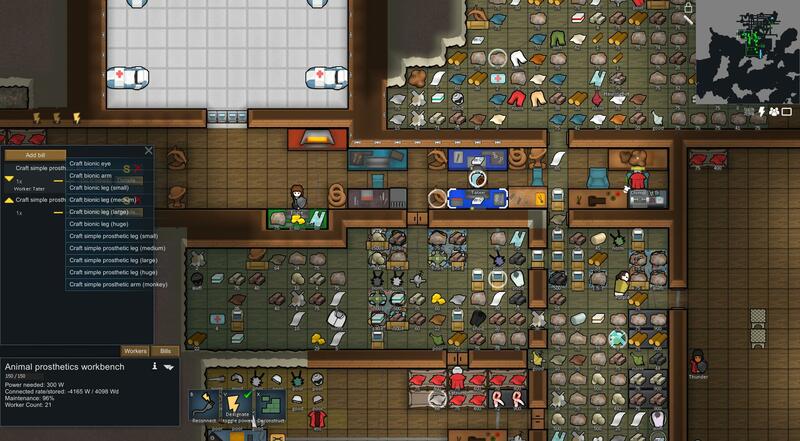 Unzip the mod in the Rimworld\Mods folder and play. * Folder and mod name changes : Uses Adventurer's Renamed Folders & About. * Rim PhD has been removed. * Advanced prosthetics now require hyperweave. * Fixed Vegetable Garden compatibility issue. NOTE : Please remove all neutroamine from map and inventories before update, otherwise it will break your save. * Medical training has been added to the pack. * Painkiller and adrenaline ribs now require go-juice and yayo. Fixed : Ingredient for sedate using Chloroform properly set. * Improved Surgery and compatibility patches has been added to pack. * Chemicals extraction & Neutroamine crafting has been added to pack. 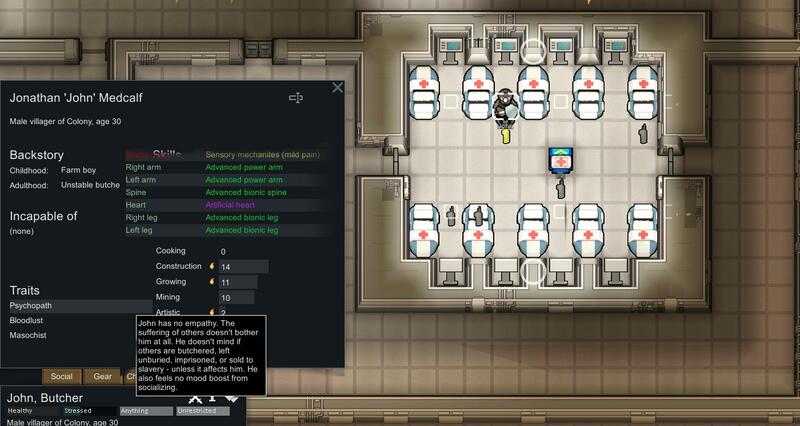 Realistic Medical System has been added to pack. Rim PhD has been added to pack. * Added bone surgery and advanced bone surgery research. Fingers and toes require bone surgery and sternum, clavicle, rib cage and spine require advanced bone surgery research. * Advanced prosthetics require plasteel and gold instead of silver(vancidium has been removed.). * Fixed : Minimap bug, work amount has been properly set. * Surgeries that require glitterworld medicine now has label. * Sedate no longer require research. * Sedate now require Chloroform(If you use Rim PhD. require Rim PhD to loaded last.) I afraid this make sedate too hard to acuire. To do list : Maybe make curing plague require Suripu-Block, gut worm require worm burn, mechanite-block to add or remove mechanite? Increased sucess chance of natural and basic surgery. Natural organ can be hauled again. Arm can be attached to shoulder. All workbenches can be moved. Removed Vancidium and advanced component. Uses silver instead. Increased surgery success chance. A lot. I forgot to remove choppable limbs, but there might be bugs so beware. Brain mod hasn't updated yet. Emergency Treatment is integrated instead. Cure sleeping sickness, gut worms, and muscle parasites. Cure malaria, plague, and flu. Cure or inject sensory and fibrous Mechanites. Inject medicine to put patients into drugged state, reduces pain by 70% and increases mood by 30. All new surgeries require researched first and require skilled doctor(Lots of new researches. Your tribes people can't just cure dementia and do plasteel surgery.). Animal bionic arm, leg, lung, heart and brain, everything is craftable. Paws, jaws, tusks etc can be repaired using plasteel, without using replacement. Stole some code from Nattiejim's code for Adogsaid. Please report any bugs, oddities or suggestions. Cookable healoot that boosts immunity gaining speed. New resource paper can be brewed in the brewery with wood or cloth and skilled colonists can write guides and test papers using paper. Colonists can study test papers to gain experience with reading table, each 1 research skill increase study speed by 10%. Guide can be used to gain new traits which increase skill, work speed, and efficiency. 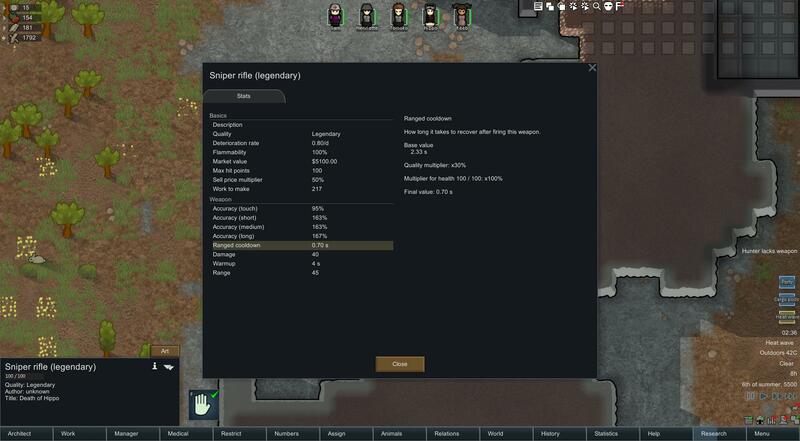 14 new traits : Negotiator, Sharp Shooter, Animal Trainer and more! BrainMod and textures from AdditionalJoyObject by CuproPanda. Make quality of weapon decrease cooldown of melee and ranged weapons. Increases melee damage factor. Updated to A15. Minor tweaks. 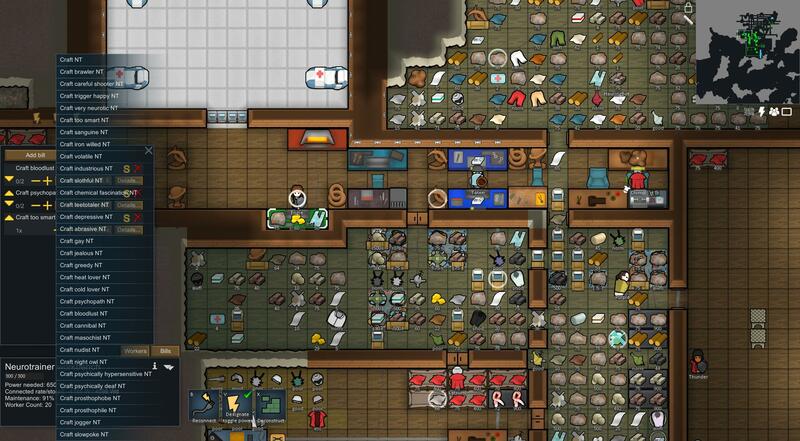 Orbital traders and caravans visit more often and caravans bring more goods. Updated to A15. Now with 4 times more neutroamine! Makes Horns & Tusks usable as material for making melee weapons and sculpture, also make mace craftable with stone. Elephant Tusk : +25% damage and -10% cooldown. Thrumbo Horn : +40% damage and -10% cooldown. Horn & Tusk Weapons by Encode. Make pirates wear worn out equipment, arrrgh! 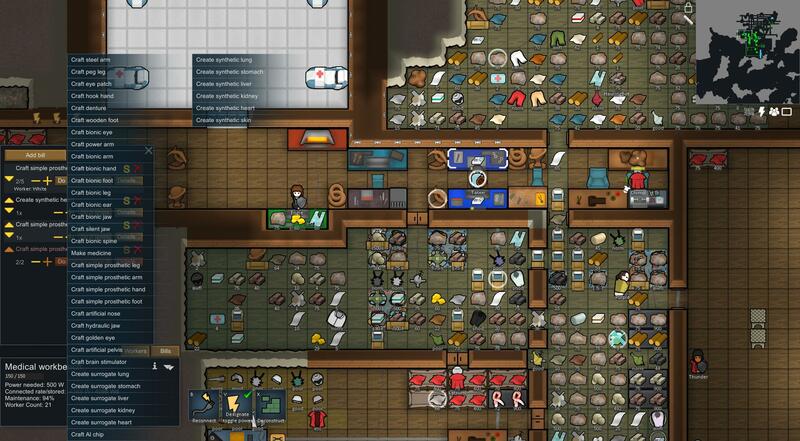 This mod is created to make craft more meaningful and to make economy less dependent on raid. I think this mod require some more work, I don't know. 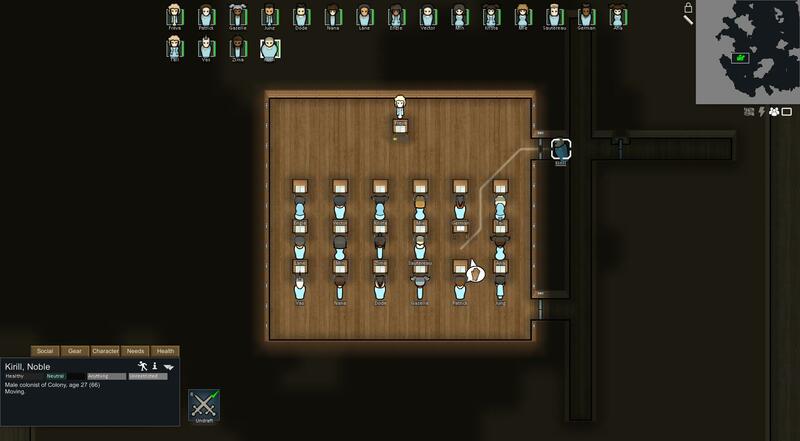 Someone need treatment but all of your colonists are sleeping? Just draft-undraft them, they'll forgo the sleep and start doctoring. 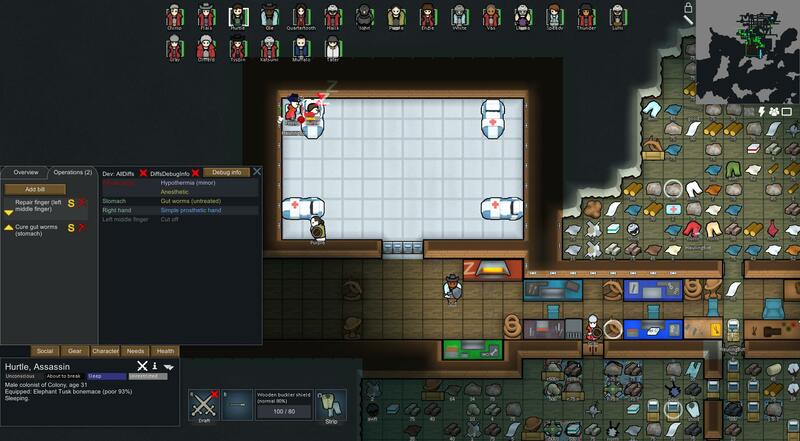 This mod make giving treatment emergency so they skip everything and do only doctoring. What is the difference between having them all separated and using your mod? Do you add any functionalities? Do you want your colonists to look manlier? Get a free mustache sample here! Is this mod incompatible with any mod? It looks good, i would like to try it but i'm not sure if it will brake my save. Curable muscle parasites and gut worms. All chronic diseases require glitterworld medicine. Craftable brain mods and neurotrainers. And regarding EPOE, how will it handle Combat Realism? Will the EPOE-CR patch still work? It should be, this mod doesn't touch body parts. These all sound excellent - any chance I could get these without EPOE? I already use the other three mods mentioned, but EPOE contains a lot of extra content that I don't want to add. 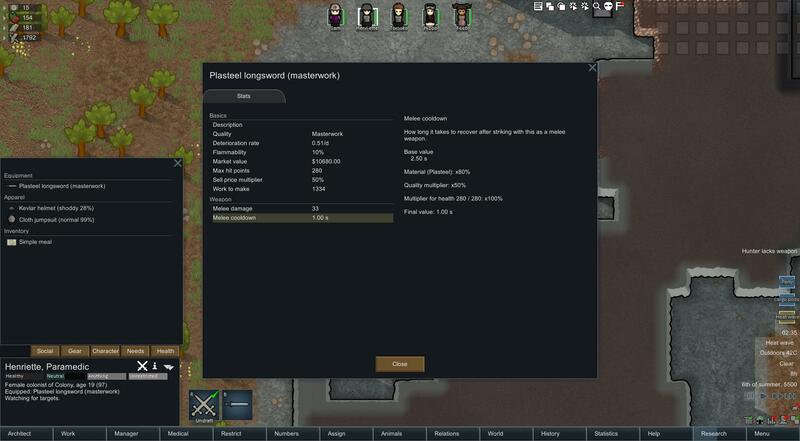 So I started a Colony with this mod, and I used the anesthesia on my colonists who would have died without it (Probably). But its been 2 almost 3 weeks since i used it on him and he's still a vegetable. Is this a bug or does it really take that long? EDIT* Just tried it on a prisoner in the same game, worked perfectly as she awoke ~3 days later, Henri is still a vegetable though. EDIT 2* got tired of waiting, 5 weeks, just sold him off for an easy 500 silver + 1 less mouth to feed.